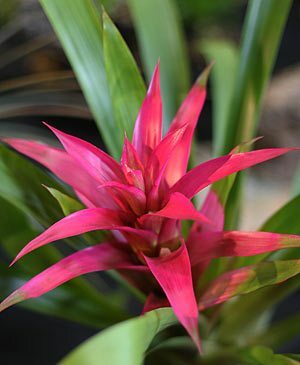 Guzmania conifera is a fascinating species with its cone like flower. Brilliant orange red held upright over glossy green foliage. G. conifera does require a little humidity and is originally from Peru and Ecuador, long lasting flower is a standout. Guzmania zamora with its tall brilliant red flowerhead is another excellent plant. Preferring a well lit or bright position but protected from direct sun, Guzmanias do well indoors or outdoors when kept under cover. Originally from the rain forests of South America they like a humid environment. 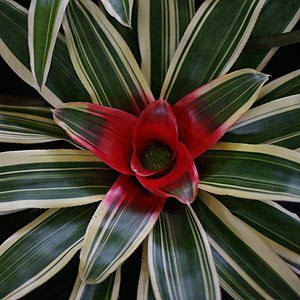 Although in Australia these wonderful Bromeliads do perform best in Queensland and Northern New South Wales, they will grow in Adelaide, Perth and Melbourne as long as you provide good conditions. A rich soil is required to get these lovely plants to do their best. Like most bromeliads Guzmanias need to have water in the leaves to do well. The inflorescence (flower) of the Guzmania is long lasting, however as they do like a warm climate, those in cooler areas could try Nidularium instead. Wide range of Bromeliads, Nepenthies pitcher plants, Anthuriums and Tropical Rhododendrons or Vireyas. All available for sale by mail order from Riverside Bromeliads and Denali Bromeliads. Includes: Bromeliads . Huge selection of cordylines available over 500 varieties including rare lines and Hawaiian imports. Bromeliad specialist. Especially species and hybrids of Vrieseas, Guzmanias and Nidulariums.